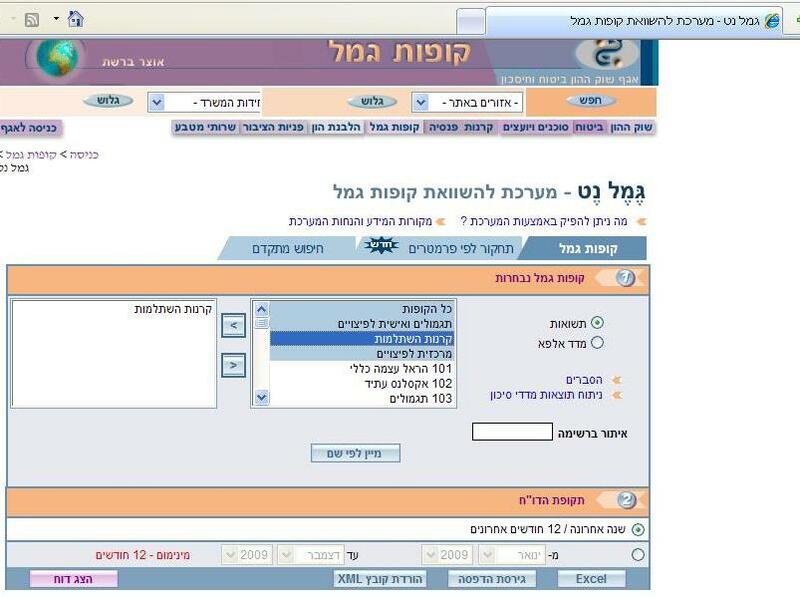 The site that measures providence funds in Israel is called gemelnet. This site is run by the ministry of finance in order to give accurate information about providence funds. Begin by entering the site. Noe: this site only works in internet explorer. Okay, now you see a screen that will allow you to select what you want to compare. In our case, we will select all of the kranot hishtalmut. Next, select the purple button that reads “hatzag doch” in the bottom left hand corner of the screen. Wait for the new page to load. Now click on the button that says “Excel” on the right side, across from the “hatzag doch” button. Save the excel file to your desktop and close the internet browser. D – this is the return (interest earned) on the fund during the period we requested – including compound interest. G – sharpe ratio – this tells us how much of the return on investment was from risk and how much was from management of risk. The higher the number, the more the return is a result of risk management, the lower the number, the more it is a result or risk. If a fund has a huge return on investment, but a low sharpe ratio, then it is probably very risky. On the other hand, if a fund has a low return on investment, but a high sharpe ratio, then maybe it is too conservative. If the return is high and so is the sharpe, then it looks like a good deal (but be warned, the sharpe ratio is not perfect. This article in wikipedia deals with the strengths and weaknesses of using this ratio.) According to the file I downloaded today, the average sharpe ratio was .49. This number really reflects your comfort with risk, so educate yourself and decide what level of risk management is too little for you to withstand and do not choose anything below what you are willing to live with. H – Average finance fee – how much of your interest you have to pay to the providence fund provider. Since every single person pays a different fee, this means nothing. I – How much money is in the fund, or market capitalization – in theory, a huge fund is a stable place to keep your money. I say “in theory”, because I was not born yesterday. Sometimes managers of big funds make stupid mistakes. But if all the other numbers look right, this number could be a measure of stability. The larger funds are called large cap(italization) or “blue chip,” named for the most expensive chip in a poker game. Medium sized funds are called mid-cap, and the little funds are called small cap. There is no technical cutoff for these, and if there is, it is different in Israel, where the market is much smaller. For our purposes, I would say that anything over a billion is large-cap, anything over 400 million is a mid-cap and anything less is small-cap. J – Net accumulation – this tells us how much money has either gone into or left the fund during the period we are reviewing. Money goes in when (1) people put in more money and (2) the funds gains value. Money goes out when (1) people take out their money (2) the funds lose value and (3) finance charges are taken by the fund managers. This number should look normal compared to the market cap. If a fund is loosing ₪ 100 million, but it is an ₪ 8 billion fund, then it could just be that some people took out their savings the past month. Look at this number along with the return on investment numbers to try to figure out why the money is going in or out. If you notice everyone is jumping ship on a fund, ask why. It doesn’t mean you should leave the fund, but it could be a red flag. Alternatively, if this number is huge, see why it is doing so well – it could be a sign of a successful management, but it could also be the result of a bunch of people blindly put their money there because someone mentioned the fund in an article in the paper. K – liquidity index – When a fund invests in less liquid assets, it is harder to value the assets exactly. This means that the information about the company’s profit (used for the interest rates, sharpe etc) may not be as accurate. Ideally this number should be as high as possible. If you want to be a real pessimist, then this number could be taken as a margin of error for the reported income. Realistically, the margin of error is usually much less. L – The name of the fund again – because this file has so many columns that you may forget what fund you’re looking at as you go from column to column. Next I checked the sharpe ratio. In the current economic climate, I am personally am okay with anything above .5 (you may not be – remember, you are risking your money here), so I sorted again and deleted any funds with a sharpe ratio less than .5. I am now down to around 40 funds. Not bad after starting off with several hundreds. Next was the market cap. I know, it may not be the greatest of ideas, but I am fairly conservative and will not go for anything less than a mid-cap. Now I am down to 20. Now I have to analyze until I find what is right for me. I check the net accumulation. Any red flags? Anything stand out for the good? I analyze why. Next, I go to the first columns and compare the 1, 3, and 5 year averages with the sharpe index to learn the story of each one. Some have too much risk and not enough management to justify it. Some are too conservative; I am willing to take the ride, even if it is only the teacup and not the roller coaster. In the end, I am down to about 4 or 5 funds. In this case, I have to either find a way to look into the companies further (who has less finance fees, which name sounds nicer, which fund managers brake for small animals etc.) or just pick one. No fund is *perfect*, but if it fits the bill and is what I am looking for, then I am comfortable with the decision. Remember, decisions are judged on the knowledge one has at the time. Even if it does not turn out well, it is still the right decision. So, there you have it. This is my plan; you may disagree. You may only stick with a sharpe of .7, or not eliminate anything without a 5 year track record. the most important thing is that you have a plan that you understand and agree with. Remember, never take financial advice blindly; always make sure you understand where your money is. No one cares about your money more than you. By jonnydegani in other everyday investments, Pensions, Insurance & Everyday Investments on February 14, 2010 . I was fortunate (?) – when I went in to my first job with a keren hishtalmut, they knew I was a kid with not much financial knowledge, so the HR person who gave me the choice told me that there were two: one was considered conservative and the other was considered risky with a higher potential for gain. Since I was fresh out of college with a degree in English linguistics and literature and the closest thing I’d taken to economics was learning how to balance a checkbook in 8th grade(! ), I took their word for it and chose the more conservative. Your blog is incredibly helpful……I have this open while I am dealing with the reps on the phone.